Situated on the bank of the Thames, just 656ft (200m) from the site of Shakespeare's original Globe Theatre, this fantastic recreation will transport visitors back to the time of the very first productions of Hamlet, Romeo and Juliet and Twelfth Night. 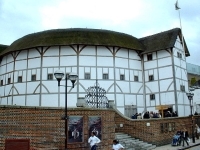 The reconstruction took a total of 10 years to complete at a cost of over £40 million, and now houses a professional theatre company responsible for regular productions of the Bard's famous plays. Adjacent to the theatre is the Globe Exhibition, presenting graphic information about the reconstruction of the theatre, and bringing to the fore the life and works of Shakespeare with interactive displays and live demonstrations. Visits to the exhibition include a tour of the theatre. Tours depart roughly every 30 minutes. Opening times: Opening hours vary throughout the year, but are generally from 9am to 5pm daily. Please call ahead to confirm opening hours before your visit. Admission: Ticket prices for performances and tours vary - check the official website for details.